The first time I entered the jungles of Thailand I was ready for anything. Sure, people had warned me of the tigers, the elephants, the pit-vipers, even the malaria-carrying mosquitoes, but I wasn’t worried. It’s in people’s nature to warn you about things they know nothing about. Plus, at 21, I had youth on my side and I’d just finished four months of tree-planting in northern BC. People had warned me about bears and cougars before I’d gone there. And nothing happened. So why would the jungle be any different? With that logic I blew off every local’s request for me to get a guide. I didn’t need one. I’d trekked to the top of Mount Ossa in Tasmania and the Golden Staircase in Alaska. All without a guide. I knew what I was doing. So, after a three-hour bus ride from Bangkok, I arrived at Khao Yai National Park. 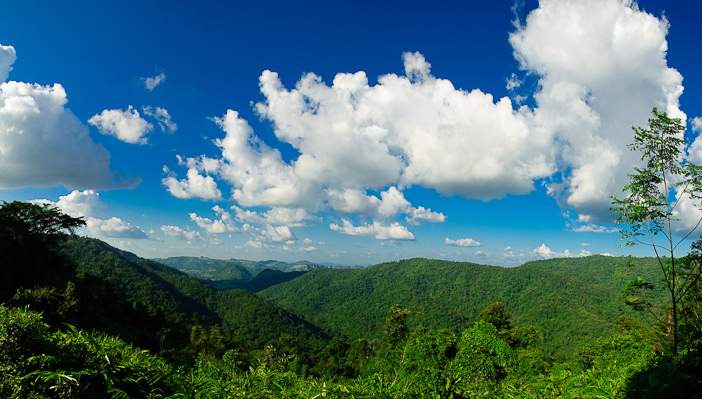 Thailand’s oldest national park, some consider it to be one of the world’s greatest. With roughly 300 wild elephants in the park, it is also home to Asiatic black bears, leopards, gibbons and macaques. Bird watchers from around the world come to see the wide variety of horn-billed birds including the great hornbill. I stayed in the extremely rustic dorm shelter for a whopping 30 baht per night. About a buck. In the morning I set off. With a light pack on my back, full of snacks and water, and a roughly sketched map, I crossed the grasslands heading for the jungle. The air was damp and sticky; it would be a stifling hike. As I entered the trailhead, the jungle enveloped me. But the first thing that hit me was disappointment: this was just like any other trail I’d been on. Sure, the trees were a little different, it was hotter than I ever remember experiencing, but it still looked like a forest. The dark brown creature looked like an inch-worm reaching for something: searching. Leaning over, I tried to figure out what it was. As I did it started heading towards me. And that’s when it hit me: leech! In panic, I glanced at my sandal-clad feet and, to my horror, discovered each foot was covered in leeches. They were already feasting on my jungle-virgin blood. I barely checked my urge to scream, but as I spun around I saw they were everywhere. Leeches from all around were inching their way towards me. So I did what anyone would do. I ran. I lost my cool and bolted like a terrified child. Getting to the trailhead again I stopped in the grasslands. Breathing heavily I ripped the leeches off my feet one by one. They lay nearly motionless on the ground, fat and bloated like overweight uncles after Thanksgiving dinner. They were virtually paralyzed with their satiety. Those little bastards. In the next few days I managed to hike many of the park’s trails guide-free. With thick canvas foot bags and a stolen salt shaker I minimized the amount of my blood that entered the jungle’s ecosystem. I saw a tiger, a great hornbill and chased the beautiful and eerie gibbon songs through the early morning underbrush to have both a black and a white gibbon stare back at me from the tree-tops. I’m not one for souvenirs, but there was a shirt I just had to buy from this park; with a large picture of a leech on the front of the shirt, a park ranger translated the words beneath it for me: The Super Star of Khao Yai National Park. Haeo Suwat waterfall. Photo by Chris Wilson, via Wikimedia Commons.